There was always discrimination amongst different people, including hero ranked people. A god weapon won’t choose a weakling to be its master. To be the master of a god weapon, there were a lot of preconditions. The first, the people who could be a god weapon’s master must be a super genius even amongst all hero ranked people. Some of them had great bloodlines, inheriting the god weapons of their ancestors. Most of the time, only one person in a big family was entitled to inherit the god weapon of the family. For example, the strongest sword of the Great Xia Sword Domain, Great Xia Dragon Finch was the god weapon that stood for the fate of the entire Great Xia Sword Domain. Only the strongest swordsman could pick it up. Some people carried the hope of countless people and even became the incarnation of god on earth, so that they could lift the source of the holy light: Holy Grail. Some of them were the master of a god’s domain or a saint dervish. The stronger the god weapon was, the stronger the mind of its master should be. There was a worldwide gap between a hero ranked person who had a god weapon and another hero ranked person who didn’t have a god weapon. For example, if a fourth ranked person obtained the recognition of a god weapon, he could even challenge a sixth ranked person who didn’t have a god weapon. Moreover, only the hero ranked people who had a god weapon had the potential to enter a higher realm. It was also a necessary step to let a god weapon become a legend ranked weapon. Just like the Sands of Time, the sword of the sixth Sky Sword Casina, before Casina was known as the sixth Sky Sword, very few people knew of its existence. Until Casina became a famous legend ranked being, then it also became a legend ranked weapon and its power was incredibly strengthened. A god weapon was the key to reaching the legend rank. Unless it was a legendary fantastic creature, none of the hero ranked people could reach the legend rank without a god weapon. Each legendary god weapon corresponded to a legend ranked being. Behind every legend ranked weapon, there was a long story or myth. Hua Yue had only seen one god weapon, Casina’s Sands of Time. Casina and the Sands of Time were like the two sides of the same coin called legend! Qumran’s Black Dragon Lance gave Hua Yue a feeling of unstoppable-ness, just like Qumran himself. It meant that Qumran’s talent was incredibly strong, otherwise, he and his standard god weapon couldn’t show this sharp temperament. “Humph, they are just several hooligans. Don’t mind them.” Qumran thought that his gallant performance was effective, he laughed. Although this was the first time he used a lance, however, he thought that the Black Dragon Lance was pretty good, at least, it was far better than other weapons. Maybe he was born to be a lancer. He even wanted to howl to express his joy. At this moment, Qumran was in high and vigorous spirits. It was a lie, but also the truth. In the endless god’s domains, there was indeed a small kingdom called Goodlund, but there was never a prince called Qumran. However, from the moment Prince Qumran appeared in front of Hua Yue and Mei, it had become truth. From now on, this prince from a mysterious kingdom of the Western God’s Domain would become a real disciple of the Sword Palace. He even had the third heirship to the throne of the Goodlund Kingdom. “Oh, you are our classmate!” Hua Yue slightly relaxed her vigilance. Since he was also the disciple of the Sword Palace, this weird meeting had a believable explanation. Perhaps, this prince and his subordinates played this trick called “The Hero Saves the Beauty”. As for his goal… Hua Yue looked at Mei, who was tightly holding her wrist in her hands. “Tut-tut, she found it? Not surprising, after all, she is from ‘that’ family.” Childe San Quan looked at them in the dark and smiled. It doesn’t matter, he didn’t expect that Qumran would reveal himself. The most important thing was the first impression. Their first meeting couldn’t be normal. The more striking it was, the deeper that maid would remember Qumran. Even by fair means or foul, he must make her remember him! At this point, Qumran did really good. It was all worth the black obsidian armor and the Black Dragon Lance. Anyway, Qumran wasn’t going to pursue Hua Yue but that maid beside her. After leaving the first impression, it was time to start the second stage. The core of the book “The Methods that can Even Let a Monkey Fall in Love” was to “hit on what one likes”. “As your classmate, it’s really a pity that I couldn’t be present at the opening ceremony together with you. 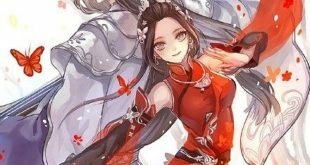 To make up for it, my treat.” With a bright smile on his face, Qumran repeated the words Childe San Quan taught him, and staring at Mei with his scorching eyes. “…” Mei’s eyes suddenly brightened up! A lot of delicious foods! “Well, thank you.” Looking at Mei’s impatient expression, Hua Yue couldn’t help but emit a sigh. Mei, you will be kidnapped someday if you continue to be like this! One dish after another was piled up on the table, one dumpling after another was quickly eaten by Mei. Mei (Star Fire)’s appetite was 10 times better than usual, her appearance looked as if she was going to eat all the foods of the restaurant. Looking at Mei’s happy face, Qumran sweated profusely. He quietly calculated the money he had. They weren’t sufficient! “That idiot! He was deceived!” Childe San Quan waved and quickly closed his fan. Not surprisingly, that girl, the miss of the Hua family, the leader of the Starwing Knights had found Qumran’s purpose. This time, his wallet really would become empty!